Did Hewlett-Packard Company (HPQ) Just Change Everything? Hewlett-Packard Company (NYSE:HPQ)’s new collaboration with Leap Motion could be a step in the right direction. PCs have become less popular the past few years, but the company is hoping that its new deal with Leap Motion will turn this trend around. Some of you probably haven’t heard of Leap Motion, so here’s a brief description of what it is. The Leap Motion controller creates a three-dimensional interaction space that allows hand and finger movements to control a computer. Popular Mechanics named Leap Motion’s new technology one of “The Top 10 Tech Breakthroughs of 2012.” Leap Motion captures the movements of all ten fingers, and is precise enough to measure 1/100th of a millimeter – smaller than the tip of a pin. Leap Motion’s first devices don’t even ship until May 13, but the company is already making splashes in the tech industry. Leap Motion has teamed up with Hewlett-Packard Company (NYSE:HPQ) to bring its brand of 3D motion control to that company’s devices. The first step will be bundling a Leap Motion controller with certain HP computers. Later, the company plans to integrate its technology directly into HP gadgets. HP’s 2012 revenue of $120.4 billion was down more than 5.7% in 2012. This marked only the second time this decade that revenue has decreased. Leap Motion could help boost 2013’s revenue, as well as revenue down the line. International Business Machines Corp. (NYSE:IBM) has seen revenue decrease three times in the past decade, but, along with Hewlett-Packard Company (NYSE:HPQ), it also experienced a decrease in revenue for 2012. While this may not immediately threaten smartphone companies like Research In Motion Ltd (NASDAQ:BBRY) or Apple Inc. (NASDAQ:AAPL), it could pose a threat in the future. BlackBerry has only seen two decreases since 2003, while Apple has increased every year, including a 45% increase in 2012. Obviously, revenue isn’t the entirety of the story. 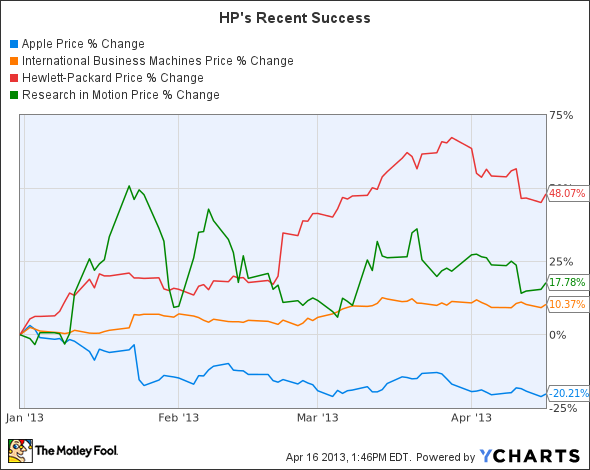 In fact, of all three companies, HP has seen the best success with its stock YTD. What If Apple Inc. (AAPL) Traded Like One of These Companies? How Verizon Communications Inc. (VZ) Is Aiding the Dow Jones Industrial Average... Apple Tablet Sales: Apple Can Rely on PC and Tablet Sales in the Future, Right... What to Expect of Apple Inc. (AAPL)? Apple Inc. (AAPL): Calling Bottom Is Dangerous Apple Inc. (AAPL), Cirrus Logic, Inc. (CRUS): Why Did My Stock Just Die?